2in1 formula that pairs Gillette's best shaving gel technology with powerful skin care. Leaves your sensitive skin feeling smooth, soft, cool and refreshed. Three effective lubricants enhance razor glide for a smooth, comfortable shave. Helps protect your skin against nicks, redness and tightness. The cap locks closed to seal off excess gel from escaping the canister. Includes a see-through gel gauge to determine exactly how much gel you have left. The canister won't rust and won't leave a ring behind. Comes with Ocean Breeze Scent.Gillette's 2in1 formula pairs shaving gel with powerful skin care. 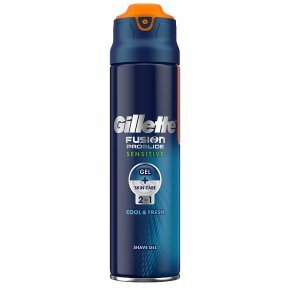 Gillette Fusion ProGlide Sensitive Shaving Gel brings you a smooth shave from start to finish with a specialized formula that hydrates to soften hair, protects your skin and improves razor glide for an incredible shave. Even better, the redesigned canister has a clean-dispense actuator, a rust-free bottom, and a gel gauge, for no mess, no rust, and no guessing.